One person hit by an unknown illness at the Westgate Las Vegas says it "spread like wildfire" through her group. 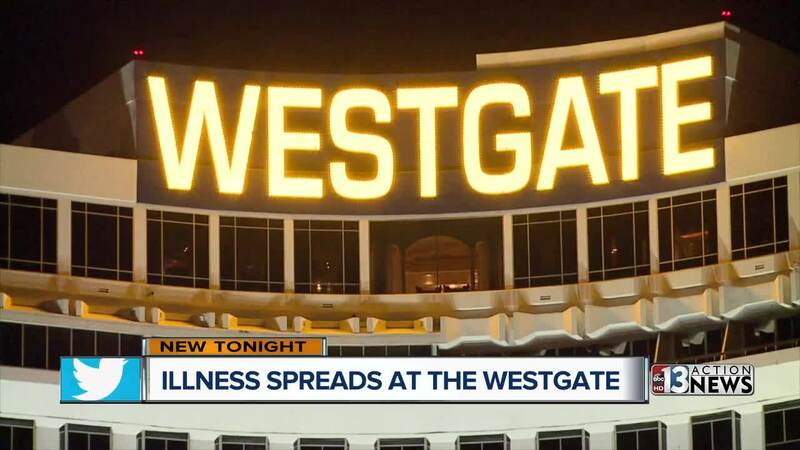 UPDATE JULY 9: The Southern Nevada Health District is continuing to investigate the apparent norovirus outbreak at Westgate hotel-casino and said they have received 300 responses to the survey about symptoms. UPDATE JULY 6: The Hot Line at the Westgate Buffet was shut down by the Southern Nevada Health District on July 4, according to SNHD's website . A representative from the Westgate told 13 Action News that the closure "was a precautionary measure" after the hotel-casino received norovirus complaints earlier this week. The Hot Line at the buffet received 19 demerits, according to the SNHD health inspection report. The prep kitchen at the buffet also received 21 demerits and a C grade, though the buffet itself got an A grade with eight demerits. According to SNHD's website, the hot line was still closed as of this writing. UPDATE JULY 3: The Southern Nevada Health District says preliminary information suggests the illness reported at the Westgate Las Vegas is consistent with norovirus. This as 13 Action News received emails from 5 more individuals who said large portions of their groups got sick while staying at the Westgate or shortly after getting home. The health district says it received complaints from the hotel Sunday regarding multiple illnesses with gastrointestinal symptoms. A spokesperson said they are still identifying complaints, so they do not have an exact number of verified complaints at this point. The health department said it is working to interview people who are sick and gather the appropriate samples. Norovirus, more commonly called the stomach flu, is responsible for an estimated 19 to 21 million illnesses a year. The health district has posted a survey online to people to fill out if they got sick at the Westgate recently. ORIGINAL STORY: One person hit by an unknown illness at the Westgate Las Vegas says it "spread like wildfire" through her group. Denielle Capozzi said she is feeling better now, but felt like she was "hit by a truck" during her stay in Las Vegas. The Reno resident was staying at the Westgate for a pageant when she said she started feeling sick Friday into Saturday. She wasn't alone. Jeff Randall said he was among eight people in town for his daughter's softball tournament who came down with what they thought was food poisoning. "We went to the buffet at 1:30 and that is when everyone started getting sick," Randall said. Randall and Capozzi both left on Sunday. Capozzi said she saw several other people sick around the resort before leaving. The Southern Nevada Health District confirmed it is investigating after getting reports of illnesses. A spokesperson went on to say the investigation was just beginning when asked to describe the symptoms or type of illness. The Westgate acknowledged the investigation in a statement late Monday saying they haven't received a report on an illness in more than a day. Those back home, like Capozzi and Randall, say they are recovering and waiting to hear back on what caused the illnesses that swept through their groups. In 2011, a stomach virus made its way through participants of the Rock 'n' Roll Las Vegas marathon. More than 500 people reported symptoms of what was determined to be sapovirus, which is thought to be similar to norovirus. Another gastrointestinal illness hit the Flamingo hotel-casino in 2004 with as many as 250 people contracting norovirus, including employees and guests. Other illnesses have made their way through Las Vegas hotel-casinos. In March and April of 2017, seven people contracted Legionnaires' disease at Rio hotel-casino . A guest at the Luxor died in January 2012 of Legionnaires' disease while several others contracted the illness. At least six people contracted Legionnaire's at Aria in 2011.